How Much Does a Bachelor’s Degree in Nursing Cost? 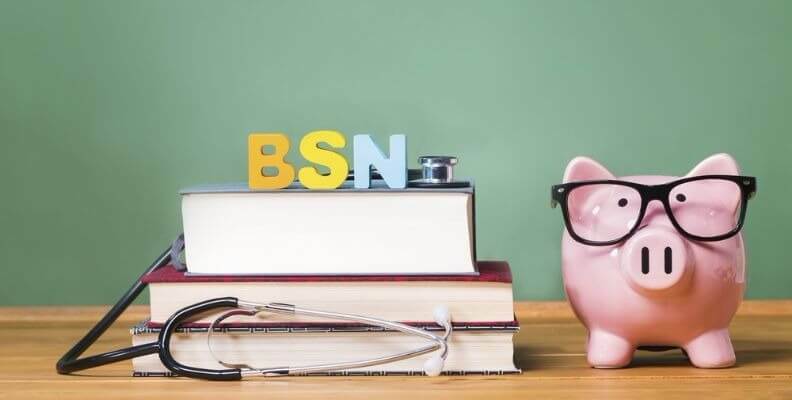 The cost of earning your Bachelor’s Degree in Nursing depends upon the institution you choose to attend, your enrollment status and living arrangements and your eligibility for financial aid. Nursing credit hours can range anywhere from $75.00 to $750.00, depending on the nursing schools you choose to attend. Considering that the required credit hours to complete nursing school can range from 100-140 among different programs, it may cost anywhere from $7,500 to $100,000+ to earn your nursing degree. Keep in mind that this does not include the cost of books, lab supplies (lab jacket, stethoscope, comfortable shoes, nursing scissors, etc. ), or living expenses. The best way to estimate how much nursing school will cost you is to contact the nursing schools you are interested in, to determine program costs directly. You can find a full listing of U.S. nursing schools on our site. Be sure to ask admissions representatives about the cost per credit hour, admissions and application fees, books and supplies estimates, as well as living and meal plans. Figuring out how to pay for nursing school can be hard! It is important to estimate your costs of tuition, room and board, books and supplies, meals, and travel expenses into your school budget. One of the best sources of financial aid for nursing school is a scholarship. At BestNursingDegree.com, we highly recommend conducting a search and applying for as many scholarships as you qualify for, including our own Back to School $2500 Nursing Scholarship. We also encourage you to file a Free Application for Federal Student Aid (FAFSA), which will calculate your eligibility for federal grant and loan money for school. Grants are financial gifts that do not need to be repaid, while loans can accrue interest and must be paid back. The U.S. Department of Education administers the program, which provides not only funds, but advice on repayment and loan management as well. If you are unfamiliar with where to start a scholarship search, you can use resources such as the internet and your public library to begin. There are some websites, such as the AACN that list scholarships specific to nursing students. You may also find grants and loan repayment options through the Health Resources Services Administration (HRSA), your State Board of Nursing, and local businesses and philanthropic organizations. If you are still attending high school, speaking with your guidance counselor can also be a great way to get the information you need easily. Take some time to request information from the nursing schools on our website to get specific information about becoming a Registered Nurse today.